CHICAGO, IL--(Marketwire - Feb 19, 2013) - The beer that delivers "refreshment as cold as the Rockies" is offering a bit more this spring to fans of snow-topped mountains. Through a partnership with K2 Sports, Coors Light and Coors Banquet are giving legal-drinking-age consumers a chance to win a variety of prizes that will make their skiing or snowboarding experience even more memorable. Prizes will be awarded through text-to-win promotions in select markets and through the Coors Light Facebook page; prizes include trips to Kamp K2, cold-activated skis and snowboards and special dual-branded merchandise. 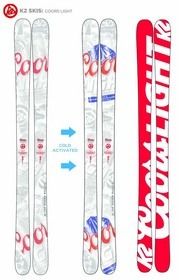 The K2/Coors Light cold-activated skis and K2/Coors Banquet cold-activated snowboard feature mountain imagery that turns blue at the right temperature, a sign that it's time to hit the slopes. "These are two brands that understand the passion people have for the mountain lifestyle, whether you live at 10,000 feet or visit a couple times a year," said Dan Hennessy, senior director of marketing for the Coors Family of Brands. "K2 helps you get down the slopes in style, and after you're done on the slopes, there's nothing like celebrating a great day on the mountain with The World's Most Refreshing Beer." The promotion runs now through April 30, 2013. Legal-drinking-age consumers can like the Coors Light Facebook page for the chance to win random giveaways, or see participating beer retailers in select markets for details on how to enter the text-to-win promotion. "K2 couldn't be more excited about collaborating with Coors Light on multiple levels," said Jeff Mechura, vice president of global marketing for K2 Sports. "K2 has been riding Rocky Mountain Freshness, in our own way, for more than 50 years. 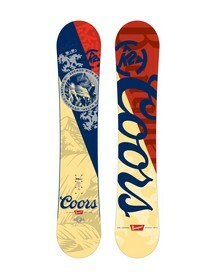 It's great to have a partner in Coors that shares the same passion for great product and fun times in the mountains." The Coors Light/K2 Sports promotion will be supported with digital marketing, including social media content and web episodes featuring K2 athletes, and with retail point-of-sale materials. The trip to Kamp K2 includes four days and three nights at the Silver Skis Lodge in Crystal Mountain, Wash., featuring no lift lines and fresh tracks in empty terrain parks. In addition to this exclusive access, winners will receive free food and beverage, as well as an invitation to attend the nightly parties in the Kamp K2 Party Tent. Additional prizing includes K2/Coors Light backpacks, hoodies, beanies, fingerless gloves and koozies. Forty-five years ago, K2 was born as America's ski company on Vashon Island in Washington State's Puget Sound. Renamed in 2003 as K2 Sports, the company today is an international portfolio of 16 world renowned brands and over 40 consumer product categories. Our brands and businesses are world renowned as leaders in design, production, and sales and marketing. Driven by innovation and a passion for the sports enthusiast looking for unique and authentic lifestyle experiences, we market snowboard, snowshoe, bike, in-line skate, alpine, telemark/Nordic ski equipment, apparel and accessories. K2 Sports is what happens when fun meets science and technology. Built on a foundation of great beer brands and nearly 300 years of brewing heritage, MillerCoors continues the commitment of its founders to brew the highest quality beers. MillerCoors is the second-largest beer company in the United States, capturing nearly 30 percent of beer sales in the U.S. and Puerto Rico. Led by two of the best-selling beers in the industry, MillerCoors has a broad portfolio of brands across every major industry segment. The portfolio is led by the company's premium light brands: Coors Light, Miller Lite and Miller64. Coors Light, the World's Most Refreshing Beer, offers consumers refreshment as cold as the Rockies. Miller Lite established the American light beer category in 1975, offering beer drinkers a light beer that tastes like beer should. Miller64 is 64 calories of crisp, light taste that complements a balanced lifestyle. MillerCoors brews premium beers Coors Banquet and Miller Genuine Draft, and economy brands Miller High Life and Keystone Light. Tenth and Blake Beer Company, the MillerCoors craft and import division, imports Peroni Nastro Azzurro, Pilsner Urquell and Grolsch, and features craft brews from the Jacob Leinenkugel Brewing Company, Blue Moon Brewing Company and the Blitz-Weinhard Brewing Company. MillerCoors operates eight major breweries in the U.S., as well as the Leinenkugel's craft brewery in Chippewa Falls, Wisc., and two microbreweries, the Tenth Street Brewery in Milwaukee and the Blue Moon Brewing Company at Coors Field in Denver. The MillerCoors vision is to create the best beer company in America through great people changing the way America enjoys beer. MillerCoors builds its brands the right way through brewing quality, responsible marketing and sustainable environmental and community impact. MillerCoors is a joint venture of SABMiller plc and Molson Coors Brewing Company. Learn more at MillerCoors.com, at facebook.com/MillerCoors or on Twitter through @MillerCoors.